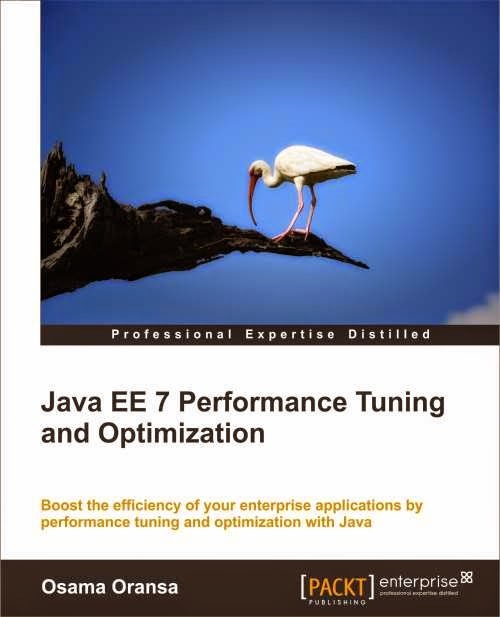 The book covers performance tuning and optimization in Java EE 7, it takes months from me to complete this book :) and i did my best to cover most of the important topics in this area. Chapter 1, Getting Started with Performance Tuning, takes you through the art of performance tuning with its different components and shows you how to think when we face any performance issue. It focuses on preparing you to deal with the world of performance tuning and defining the handling tactics. Chapter 2, Understanding Java Fundamentals, lays the foundation of required knowledge of the new features in Java Enterprise Edition 7 and different important Java concepts, including the JVM memory structure and Java concurrency. It also focuses on the different Java Enterprise Edition concurrency capabilities. Chapter 3, Getting Familiar with Performance Testing, discusses performance testing with its different components, defines useful terminologies that you need to be aware of, and then gives hands-on information about using Apache JMeter to create your performance test plans for different components and get the results. Chapter 4, Monitoring Java Applications, dissects the different monitoring tools that will be used in performance tuning, starting from the operating system tools, different IDE tools, JDK tools, and standalone tools. It covers JProfiler as an advanced profiling tool with its offline profiling capabilities. Chapter 5, Recognizing Common Performance Issues, discusses the most common performance issues, classifies them, describes the symptoms, and analyzes the possible root causes. Chapter 6, CPU Time Profiling, focuses on the details of getting the CPU and time profiling results, ways to interpret the results, and ways to handle such issues. It discusses the application logic performance and ways to evaluate different application logics. It provides the initial performance fixing strategy. Chapter 7, Thread Profiling, discusses thread profiling with details on how to read and interpret thread profiling results and how to handle threading issues. It also highlights the ways to get, use, and read the thread dumps. Chapter 8, Memory Profiling, discusses how to perform memory profiling, how to read and interpret the results, and how to identify and handle possible issues. It also shows how to read and query memory heap dumps and analyze the different out of memory root causes. The chapter finishes your draft performance fixing strategy. Chapter 9, Tuning an Application's Environment, focuses on tuning the application environment, starting from the JVM and passing through other elements such as the application servers, web servers, and OS. We will focus on selected examples for each layer and discuss the best practices for tuning them. Chapter 10, Designing High-performance Enterprise Applications, discusses design and architecture decisions and the performance impact. This includes SOA, REST, cloud, and data caching. It also discusses the performance anti-patterns. Chapter 11, Performance Tuning Tips, highlights the performance considerations when using the Agile or Test-driven Development methodologies. This chapter also discusses some performance tuning tips that are essential during the designing and development stages of the Java EE applications, including database interaction, logging, exception handling, dealing with Java collections, and others. The chapter also discusses the javap tool that will help you to understand the compiled code in a better way. Chapter 12, Tuning a Sample Application, includes hands-on, step-by-step tuning of a sample application that has some performance issues. We will measure the application performance and tune the application issues, and re-evaluate the application performance. Packt Publishing offers free shipping to UK, US, Europe and selected countries in Asia. I hope everyone found this book useful and get the maximum value from the book topics.